Factory HRC Honda team rider Helder Rodriguez took an historic stage one win in the Rallye Maroc in his first competitive outing onboard the all new Honda CRF450 Rallye. 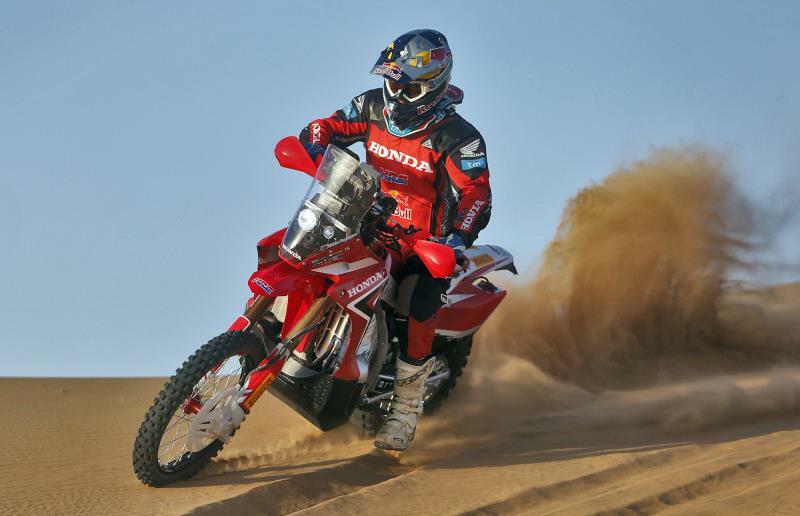 It what was the HRC-prepared bikes' first competitive outing following Honda’s announcement that they will officially return to the Rallye scene with a factory Dakar effort in 2013. Rodriguez took victory on the 271km stage one from Dakar legends Marc Coma and Cyril Despres who both ride for the factory KTM squad. Rodriguez’s win underlines the potential of the new Honda and the seriousness of the new project. The true test on Rodriguez’s pace and the potential of the HRC package will be seen tomorrow when the Portuguese rider has to lead out the second stage. Fellow HRC Honda Team rider Sam Sunderland was the highest placed Brit securing an impressive tenth place finish at the end of stage one. Irishman Stan Watt was classified in 33rd at the end of the opening stage onboard his KTM 450R Factory. Like the rest of the field, Watt is using the tough Rallye Maroc to prepare for the 2013 Dakar which kicks off in January 2013.